Curtis White is coming into his own amid a breakthrough cyclocross season. Curtis White knew he was on winning form from the very first lap of the Pan-American championships, held November 4 in Ontario, Canada. White, 23, had made the race a major target of his season. The focus paid off. White made the front group alongside his Cannondale-Cyclocrossworld.com teammate Stephen Hyde, Garneau-Easton’s Michael van den Ham, and Kerry Werner of Kona-Maxxis. Hyde eventually crashed out. Then White and van den Ham left Werner behind to make for a two-rider battle. White took the victory — the biggest of his young professional career — with a convincing sprint. A week later White rode his winning form to two more victories, taking both days of the Verge Northampton race weekend. The following weekend White was at it again, winning both days of the Supercross race in Suffern, New York. The five victories pushed White into third place in USA Cycling’s Pro CX standings. White’s step up comes at a crucial time for the Cannondale-Cyclocrossworld.com. The team’s star, Hyde, missed much of the early season due to a fractured sternum suffered at the World Cup opener in Waterloo, Wisconsin. With Hyde fighting to regain his national championship form, the torch was passed to White to contest for the wins. White’s step up also comes at an important moment for his career. White has been a member of the domestic scene’s elite circle for years. He is the older brother of U23 phenom Emma White, and has raced cyclocross since he was 10 years old. He joined the Cannondale-Cyclocrossworld.com team in 2013 at age 18, riding alongside Tim Johnson and Ryan Trebon on the powerhouse squad. White made steady progress as a U23 rider, but big wins regularly eluded him. He was a perennial favorite to take the U23 crown but always missed the top step. In 2016 he finished a close second to Tobin Ortenblad by just 10 seconds. Ortenblad took a major step forward in 2017, winning several national races. Lance Haidet, another of White’s peers, also made strides early this season, winning the Reno Cross race. Over the past month, it’s been White’s turn to win. White said his progress in the sport has come through trial and error. White also raced as a pro on the road, most recently with Jelly Belly-Maxxis. He said he occasionally spread himself too thin between the two disciplines. 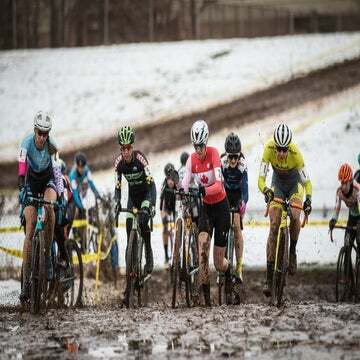 In early 2017, following a strong cyclocross campaign, White raced an under-23 classics block with the USA Cycling national team on short rest. The trip did not go according to plan. White credits his step up to several changes he made behind the scenes. In 2017 he hired a new coach, Al Donahue, who also coaches Hyde and Ellen Noble. White said the change in coaching led to an increase in form, and a drop in weight. White says he has lost 10 pounds since the 2017 season. White also hired a sports psychologist, Wally Bzdell. The process of training and racing had become stressful, he said, and he looked for guidance for how to navigate the sport’s mental and emotional challenges. White hopes to ride his winning form into December and the new year. He is now on the short list of favorites to win the U.S. men’s cyclocross elite title in Louisville on December 16. He then heads to Europe for several weeks of international racing. 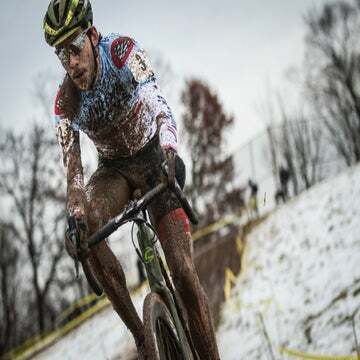 He will race the December 23 World Cup round in Namur, Belgium, and subsequent World Cup rounds in Heusden-Zolder, Pont-Château, and Hoogerheide. The trip marks White’s first extended World Cup racing schedule in the elite field. The winter racing block will be different for White this year. In years past he had college to contend with. White is a senior at Union College in Schenectady, New York, where he is pursuing a classics degree. In years past, White said, he often traveled to races with his school books. Not this year — White recently completed his final classes. The other major pull in White’s life, his professional road career, may also be changing. Jelly Belly’s demise at the end of the 2018 season has put White’s road ambitions on hold. He is unsure whether or not he will race on the road in 2019. Whether a pro road contract materializes, White is focused squarely on cyclocross for the coming months.